A public service ad going around Facebook shows all the things those with Down syndrome are doing to live full, exciting lives. It includes athletes, public speakers, actors…and David DeSanctis, who is all of the above. The 23-year-old Louisville, Kentucky, native has accomplished more than most people his age, including starring in the major motion picture Where Hope Grows. But perhaps the most notable thing about David is the fact that he was born at all. Nine out of 10 babies diagnosed prenatally with Down syndrome are aborted. David hopes his success will show the world that the lives of Down syndrome children are worth living. Where Hope Grows is part of that. It won the Audience Choice Award at the Heartland Film Festival and was an Official Selection of the Dallas International Film Festival. It’s the story of a failed major league baseball player and failing single dad (Kristoffer Polaha) who drinks his troubles away until he meets “Produce,” a young Down syndrome man who works at the grocery store. At first glance, Produce looks like an unfortunate individual, but it’s his courage and honesty that inspire the man to conquer his demons and become the best version of himself. David, along with his parents, Bill and Julie, spoke with Catholic Digest about the film and about his hopeful, happy life. First of all, I love that you have a Catholic last name. I do. My last name means “holy.” I’ve always been holy my whole life. I attend the Church of the Epiphany. Your character, Produce, is a charmer. He has confidence, and yet he’s vulnerable. Is your character a lot like you personally? Yes, in several different aspects—positive outgoing, upbeat, and lively. You’re an amazing actor. Did you ever do any acting before? This is my very first feature film. I’ve never acted professionally before. I’ve only acted in one high school stage production, and I only had three lines. What was your favorite part of making the movie? Just being with “my family.” By the end of the movie, the cast and crew came together as a family. They were a bunch of extremely happy people. 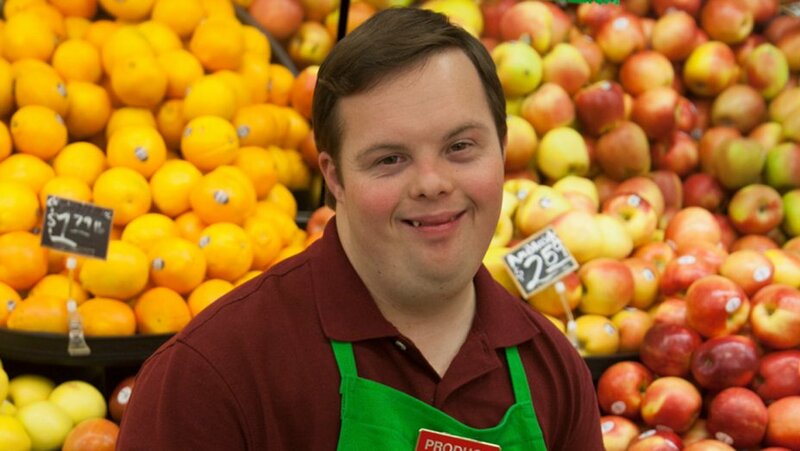 The producers were looking for a Down syndrome actor. [The special needs groups in Louisville] told them they had an ambassador and a public speaker. I’ve given advocacy speeches throughout my life. I did a luncheon meeting with the on-site producer in Louisville, and by the end of the meeting, he suggested I do an audition tape. Bill (David’s father): He beat out thirty people for this role. How did you get into public speaking? I took a public speaking class in college. I became a speaker for special needs—for groups like Special Olympics, Best Buddies, and Angels in Disguise. You obviously were the hands-down winner. That’s exactly the reason I got the part: my personality. Bill: The producer was trying to get someone with childlike faith. How was the Hollywood premiere? The premier was magical. It was at ArcLight Cinemas in Hollywood. I had the best-looking outfit there, besides my dad. It was kind of country looking, like almost as if I were going out on a date or something like that. At the post party afterward, even though I was tired, somehow my body and my mind were still up and going. I had fun. Which of the celebrities at the premiere was your favorite? My favorite celebrity was Nicole Scherzinger. She grew up in Louisville, too. We did a little dance-off in the studio. She won Dancing with the Stars, but I crushed her in the dance-off. They wanted to use that as a promo for the movie. In a Red Carpet interview, Nicole Scherzinger said, “This is actually a film that’s got a real purpose, a real meaning, a real message behind it.” She is a global ambassador for Special Olympics. What do you hope people will take away from the movie? Hope, faith, love, being part of a family—and magic! I saw that you attended the March for Life last year. With the rate of abortion at 90 percent, what do you wish people knew about people with Down syndrome? I am one of those 10 percent. I’ve been part of the Special Olympics. Anyone can come in to one of the sporting events and see us play our sports and be uplifted. Are you saying you wish people would simply get to know Down Syndrome people? Tell me about all the sports you play. Bowling, basketball, flag football, golf, and softball. I used to do gymnastics, swimming, and ice skating. Julie (David’s mom): We have to keep this boy busy so he won’t sit in front of a screen all the time. Yes, four others besides myself. They are all older. Julie: One of the reasons David can do what he does is that they all just pulled him along. Do you think Hollywood will look you up again to do another movie? Yes, yes, yes. A definite yes. I hope they do. I hope you become famous, not necessarily for your own sake but so that you can be the voice of the other 90 percent. Bill: That’s what we want him to do so that people can see the beauty of those with Down syndrome and recognize their potential. That is exactly the reason why this movie needs to be out there: so people can see our abilities, not our disabilities. This article first appeared in Catholic Digest, October 2015. Read about Orphan Outreach Ministry next.